If you are suffering from hemorrhoids, pain, itching, or bleeding are common symptoms you will experience. The good news is that there are many products available to help ease these symptoms, including Calmovil. 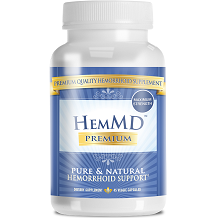 If you are looking for an unbiased Calmovil Hemorrhoid Relief review, then you are in the right place. Read on to learn more about this product. Calmovil is proud of its only natural ingredients that come from plants and herbs. These ingredients have anti-inflammatory and vascular-protecting properties to prevent bleeding, itching, and pain among other symptoms. Some ingredients like chamomile also provide soothing effects to relieve of pain and discomfort. The recommended dosage for Calmovil Hemorrhoid Relief is one pill per day to help you manage the symptoms of hemorrhoids. There is limited information as to the possible side effects. 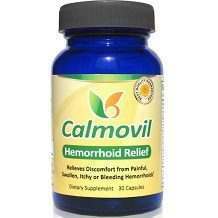 The manufacturer claimed that since Calmovil Hemorrhoid Relief is made of natural ingredients, side effects are minimal. Many users likewise said that even if the product didn’t work for them, they didn’t experience any side effects. Nonetheless, pregnant and breastfeeding women are strongly advised not to take Calmovil. If you are taking blood-thinning medication or have a bleeding disorder, Calmovil is also not recommended. A bottle of Calmovil Hemorrhoid Relief contains 30 capsules and will cost you $47.95. If you purchase directly from the manufacturer’s website, you can also get a free e-book of 20 proven tips to heal hemorrhoids worth $19.99. Here’s the catch: shipping fee. Shipping will cost you almost $20 and in case you are buying from abroad, the cost is way more than the actual purchase price. What if you are unhappy with their product? Thankfully, the company offers 60-day money back guarantee. All you need to do is to return the unused portion of your purchase and Calmovil will refund your money including shipping costs. Unfortunately, the manufacturer didn’t state as to how the condition of the bottles should be when you return the product. Also, the guarantee covers the unused portion and no discussion as to what will happen with the opened bottles. Calmovil provides several scientific studies proving the efficacy of the ingredients found in their capsules. The money-back guarantee, plus free e-book to help you manage hemorrhoids, are also a big plus. On the other hand, the price for Calmovil is more expensive compared to other hemorrhoid products. There are products that could provide relief without charging you almost $50, excluding the shipping fee. There are also some users who reported that the product didn’t work for them. The website also has unclear usage directions as to the proper dosage of the pill. You have to buy the product first and read the instructions to know the proper dosage of this treatment. Watch out for side effects too, since a product made of natural ingredients doesn’t necessarily mean zero side effects. It is important to pay attention to how your body will respond to the pill and discontinue use if you notice something unusual.